Our outlook for the economy deteriorated slightly in the last month. Mainly our measures of output are showing weakness, while our measures of employment continue to show a solid recovery. The risk is the manufacturing sector’s weakness spreads to the broader economy. Most economists would agree the chances of this event happening are small, though we believe the chance is probably higher now than it was a few months ago. 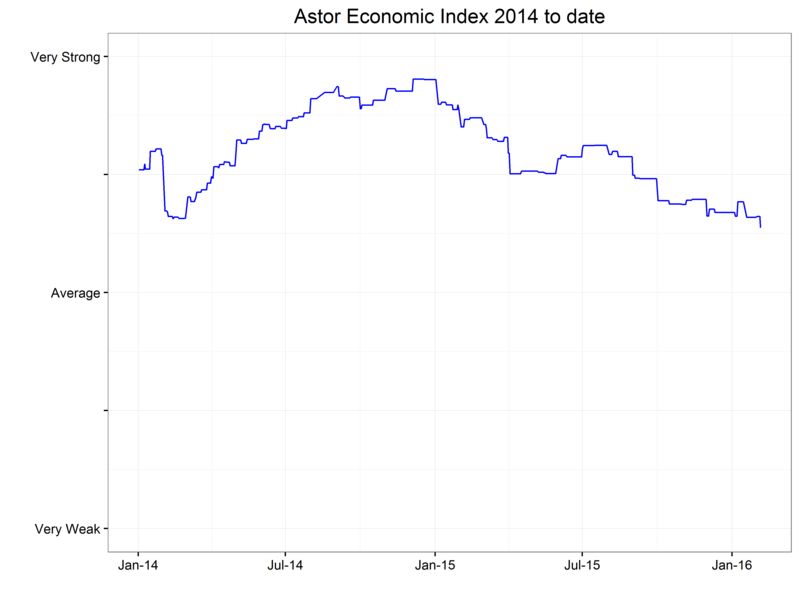 Our Astor Economic Index® (“AEI”) shows growth somewhat above the recent average and slightly worse than last month. The AEI is a proprietary index that evaluates selected employment and output trends in an effort to gauge the current pace of US economic growth. A carefully constructed gauge of the current state of the US economy is GDP Now from the Atlanta Fed. This uses current economic data as released to try and ‘nowcast’ the current quarter well before the official GDP release. Currently, this model is seeing the data released thus far for this quarter as consistent with 2.2% GDP growth (SAAR), roughly what the Blue Chip Survey is forecasting. The important point is that as of the end of January, and despite the concerns sketched above, we do not believe there are signs of broad economic weakness and we believe it would take some additional shock to cause it. 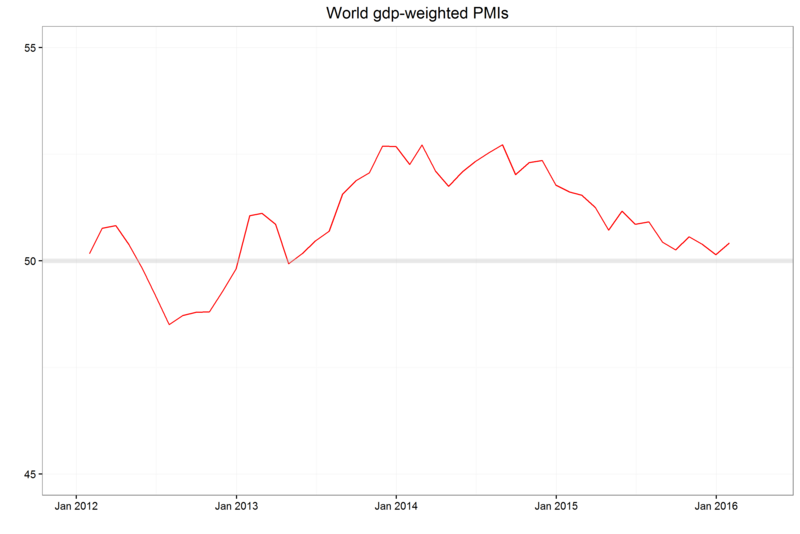 It is just possible we see signs of the end of the deterioration in the world economy. The chart below weights all the G-20 countries by their GDP to average their respective Purchasing Managers Indexes. These indexes are constructed to show expansion in the manufacturing sector at readings above 50 and contraction below 50. The world, as a whole, according to this measure may have stopped deteriorating in the last few months after falling steadily from the middle of 2014. The world equity markets obviously do not agree, with virtually all major markets posting large declines year-to-date. We believe stock markets can overreact to every worry – the old joke is that they have predicted ten of the last five recessions. A more uncertain world environment may argue for lower levels of earnings and a reduction in the amount investors are willing to pay for them. On the other hand, the global economic weakness of the last 18 months or so is probably more notable for the dramatic reduction in the price of oil and increase in the value of the US Dollar. Neither oil nor the dollar has extended those trends so far in 2016. The first rule when you find yourself in a hole is: stop digging. Perhaps these markets have stopped digging. We believe a stable market environment for energy and exporters would be a good foundation for the economy to build on. We think the financial market volatility has increased the likelihood the Federal Reserve will delay its next rate hike. The increase in credit spreads over the last few months, for example, has made financial conditions tighter than they were when the Fed last hiked (as noted by NY Fed chair Bill Dudley here). One implication of that is the Fed may need to adjust the federal funds rate less, given this spontaneous tightening. Fed Chair Janet Yellen testifies before congress on Wednesday, after this note is being composed. She will presumably attempt to mention financial market volatility but likely be careful to avoid saying anything of interest. I expect her to reiterate the consensus that the US economy remains intact and that history has shown the US to be resilient to foreign economic conditions. She will likely say, like the last FOMC statement, that she expects to see economic conditions evolve in such a way as to make a gradual increase in the federal funds rate appropriate. Overall, I am a bit more concerned about the US economy. There may be signs of stabilizing in the international environment, but I will need to see a few more months before I breathe easier. I expect the Fed to not make matters worse in the short run, but at the same time, I do not expect them to take steps to stabilize financial markets absent a dramatic swoon.